In June, we celebrated a whole department (Water Quality). Now, in July, a whole department nominated a volunteer! The entire Marine Mammals department nominated Sarah Ward to receive the Volunteer of the Month award. She represents many aspects of a great volunteer: She’s personable, versatile, takes initiative and is a great mentor to new volunteers! 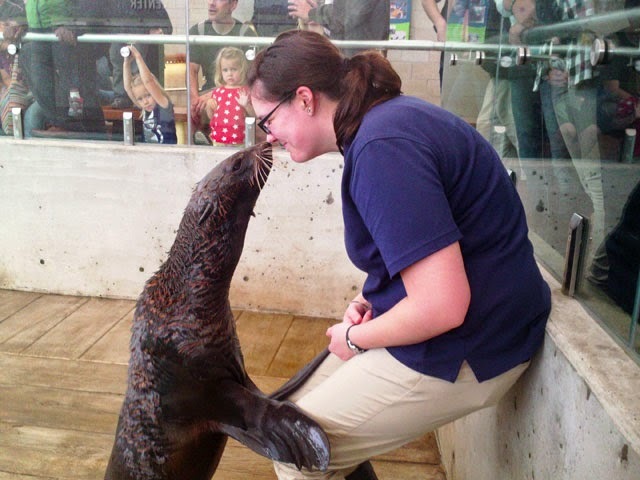 We would like to nominate Sarah Ward from the Marine Mammal department for Volunteer of the Month! Sarah has been with the mammal department for almost one year. She loves the aquarium so much that she now works in the gift shop as well. Her customer service skills are superior and she has handled difficult guest interactions professionally and appropriately. This nomination was a group decision from all the staff that has the pleasure of working with Sarah on a weekly basis. Our department, like many others, could not run smoothly and effectively without our committed volunteers. Sarah participates in many tasks that are important to our animal’s welfare including diet preparation and exhibit cleaning. She is also creative in enriching the animal’s lives through play sessions and provides guests with valuable information about the animals during public presentations. Sarah takes the initiative to complete tasks and has proved to be a valuable mentor in training new volunteers and interns. She goes above and beyond to ensure the cleanliness of the area by completing the tedious job of locating and removing fish scales that get stuck everywhere. The team is lucky to have Sarah as a mentor for newer volunteers and interns because she is a very thorough and understanding teacher. She follows protocols perfectly and is never afraid to ask questions. She understands the importance of following these protocols for safety reasons and trains people accordingly. Sarah has a quiet presence and remains professional at all times. This ability to stay even keeled is highly valued in our department. The joy she gets from working on the mammals team and giving the animals a great day is clear in her expression and attitude. Her positive personality and work ethic makes her a great role model for everyone she is around. Not only is she a Marine Mammals volunteer, but she also works as staff in the Gift Shop! Join me in congratulating Sarah!